One of the biggest challenges to local arborists and construction managers is maintaining trees on construction sites. Whether you are the construction company foreman or the homeowner, you need to do all you can to maintain and assure survivability of the valuable native trees on the construction site. The homeowner has specific expectations around which native trees he or she wants to incorporate into the new landscape, but additionally, the local city arborist has expectations with respect to native tree survivability and tree protection. Sometimes, mistakes in the tree protection plans can shut down construction projects until the city specifications are met! I have personally seen this many times. So getting this right is crucial. This is why you should consult with a certified arborist as early in the process as possible. A number of factors associated with trees and construction come into play but by far the main factor is root compaction or destruction. Tree roots expand to the drip line (outer canopy) of the tree and then at least 1/3rd of the roots often extend past that. In areas where roots are restricted on one side of the tree, the roots may compensate by growing out 2-3 times past the drip line. Generally though, a municipality expects the construction company to fence off a tree’s roots to the drip line all around the canopy whenever feasible. Once fenced off, this area cannot be walked on or driven on. In conjunction, they also often recommend that this area be mulched as well, to additionally reduce compaction and reduce water loss. The damage done to a root system by crushing the soil with heavy construction equipment can be irreversible. The problem here of course is that the damage cannot be seen and may only be realized once construction is finished. With many construction workers being unaware of the importance and shallow nature of a tree’s hidden root system, workers are simply unaware of the damage they are doing. Most of a tree’s root system only exists to two feet below the surface. Additionally, most of a tree’s absorbing roots only extend 8-12 inches (max) below the surface soil. Grading can scrape away 50-80 percent of a tree’s important absorbing roots. Add compaction and often trenching to the equation, and it’s a miracle that many trees survive construction at all! Often, I am called in after this root damage has already been done. It is much more difficult to revive trees after construction damage, and we often loose trees at this point. Certain species such as already stressed trees or more susceptible species such as post oaks, often die even with minimally invasive construction. Trenching too close to the trunk of a tree can sever large vital anchoring roots, and lead to trees actually falling, especially in high winds/storms. This can be a serious and even deadly mistake.There is a rule of thumb for trenching close to trees; the trench should be no closer that two and a-half times the trunk diameter away from the base of the affected tree. Vehicle compaction crushes not only tree roots, but also compacts the soil itself, having a crushing effect and reducing ‘pore space’ associated with healthy soils and optimum roof growth. This is called a ‘traffic pan’. Oxygen is reduced when soils are compacted. Water cannot penetrate as easily, permeation is reduced leading to less water absorption and more run-off. Rubber tires do more damage than tracked vehicles, because the psi is much higher due to the small amount of surface area between the rubber and the soil associated with the overall vehicle weight. On a tracked vehicle, the weight is distributed over a large track, whereas rubber tires put all the weight onto several square inches. To put the importance of compaction in perspective, even rain drops falling on bare soils add to compaction! When a development is phased for construction, and the lots are surveyed, the trees are then inventoried. Then, certain trees are set aside as protected trees and certain trees are flagged for removal. Whether it is a commercial project or a new neighborhood, these protected trees are the ones we have to fence off and save. As municipalities are becoming more and more involved with these processes, the general requirements are also getting stricter. Compliance is mandatory from the beginning of the project to the end. Often, trees have to be fenced off prior to construction. Also, trees often have to be mulched and fertilized before construction begins, and then additionally re-fertilized after construction. Sometimes, construction companies are required to put up bonds when they are building around large, old and extremely valuable trees. In Northern California 15 years ago, I remember a construction company killing a bonded tree in the middle of a new Saratoga neighborhood. They called me out after the damage was already done, and the tree died. The tree cost the company $20,000.00 because they did not adequately protect the root zone as required by the tree protection requirements. Sometimes simple plastic fencing is required by the city to fence off the root zone, sometimes more adequate fencing is required. Some municipalities, depending on the job, require that a minimum 6 foot chain link fence be installed around the drip line. Most tree protection plans I do recommend the chain link fences, as the plastic ones are often driven over by over-zealous bobcat/heavy equipment operators. It is really difficult to successfully keep all construction crews off the root zone of a protected tree throughout all aspects of construction without putting up a more substantial chain link fence. The problem with tree protection plans is always communication. There are scores of completely different and unrelated construction crews that are involved with all the different steps involved with the building process. It is very challenging for a construction foreman to supervise all of these different crews throughout the long construction process. Years ago when I had my house built, I had the construction foreman erect a plastic orange fence around my only front yard live oak. He would not put up a chain link fence, even though I requested it. It all went well through the entire construction process until the lot was graded in order to put down the sandy loam beneath the St. Augustine. A bobcat operator ignored the plastic fence and graded the entire root zone of the tree. I was able to stop it before it got worse, but it caused a lot of unnecessary stress to my front yard tree. Front yard trees are almost always more negatively impacted than back yard trees. The compaction and damage to the trees in the front of the house are always associated with the majority of the heavy equipment as all of the materials are brought in from the street. Additionally, work crews often eat their lunches under these trees. It’s much cooler under a trees canopy outside with the breeze blowing than it is inside the newly constructed building. Interestingly, even worker foot compaction to these root zones can have a negative impact on root and soil compaction, especially on bare soil. 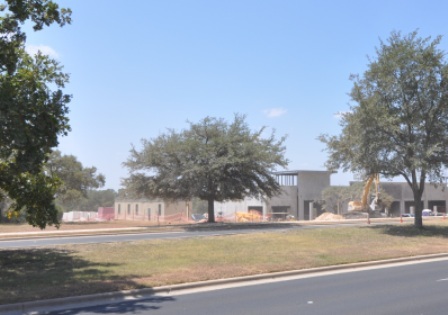 As local Central Texas municipalities constantly refine and revise their tree protection requirements for new construction, deep root fertilization is vastly becoming an important and necessary component. Most municipalities, such as the City of Austin, for example, are now requiring pre and post-construction deep root fertilization. Generally, the requirements are that the root zone, to the drip line, be fertilized using a pressurized, generally slow release, fertilizer mixture applied using a ‘fertilizer gun’ with a sharp tip. The fertilizer gun is essentially a soil probe with a tip that has four holes in it. The tip is inserted into the root zone of the tree at 2-3 square foot intervals, usually 5-6 inches below the surface directly into the absorbing roots of the tree. The pressure of the system usually varies from 150 to 300 PSI. This procedure also breaks up compaction and gets additional water to the root zone. The slow release aspect is a granular fertilizer that does not completely dissolve in water, but rather breaks down over a 12 month period. This is much more effective and long-lasting than a water-based (much cheaper) fertilizer that then leaches right out of the soil after the first rain. Another important factor, although generally (but not always) less severe than root destruction, are the pruning/limb removal concerns during the construction process. Sometimes heavy equipment or large trucks break off large overhanging limbs, which need to be immediately addressed. Sometimes construction crews have to remove sections of large trees in order to erect the second stories to the building, or the rooftops/gables or overhangs. It is always better to call in a professional tree crew quickly to take care of these issues. Having the construction crews use circular saws or jigsaws to remove limbs can lead to limb tearing or sometimes flush cutting that can not be repaired. Additionally, oak wilt concerns need to be addressed, and the cuts need to be sealed off. Also keep in mind that we can usually get a crew out to a site right away to take care of these issues, and it is often not even that expensive. Also, municipalities are starting to require that pruning by professional tree crews supervised by a certified arborist be a part of the overall tree care requirements on construction sites. It is imperative that a good tree protection plan be improvised from the very beginning of the construction process for maximum health and survivability of all the native trees you want to or are required to incorporate into your landscape. It is very rare that I run into homeowners or construction foremen who are not sensitive or aware of the dollar value and overall aesthetic value that trees bring to a new buildings landscape. It is almost always just as important to them a that trees survive as it is to the city arborist. A large dead native tree is as devastating to the homeowner as it is the construction foreman/company. Generally, the components that are missing on the construction site are not compassion or care, but knowledge as to how trees can be saved and what not to do to ensure survivability. Also, the communication aspect associated with every aspect of the construction process, as new crews constantly come and go. If you can erect 6-8 foot chain link fences around the tree roots to the drip line or beyond, before construction starts, add mulch and have a pre and post construction fertilization done, the trees will survive and thrive. Additionally, have any pruning done by a professional tree crew supervised by a certified arborist. Frequently monitor to make sure the fences aren’t driven over or pulled apart and keep all foot traffic and vehicle traffic off the root zone! Trench as far away from tree roots as possible, and keep all fill soils, construction debris and material off or as far away as possible from the root zones. Better yet, consult me first and I will be happy to discuss these and other pertinent factors associated with your specific site and concerns. Let’s keep your trees alive from the start and avoid costly tree loss and replacement requirements. It is much easier to keep trees alive at the front end of a project than try to reverse construction damage on the back end.